Christine Thompson ran for Livingston County school board to improve the schools for her two daughters and make a difference in her community. But when she won, Thompson made history as the first Hispanic woman elected to office in the Commonwealth. Districts hope that the Volkswagen settlement will mean they can replace old, inefficient buses, but Kentucky’s share of the funds remains in limbo. Find out what the state has said it wants to do with Kentucky’s $20 million share and how other states are using their settlement cash. 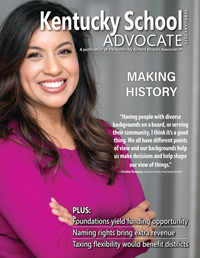 Nearly 30 percent of Kentucky school districts are getting extra help. From foundations to fund teacher grants, summer programs and other learning opportunities for students. Learn how foundations fill the funding gap and find out what it takes to make a foundation a success. One western Kentucky district has received $1.3 million by selling naming rights to many of their athletic facilities and academic areas. Find out why McCracken County’s superintendent says it’s a win-win for the district and community, and what are some guidelines to consider if your district is considering going that route. School boards face many constraints on their ability to raise revenue. Learn how tax flexibility could help districts tailor their taxes to the local community and reduce reliance on property taxes.